When you've done all you can with existing Victorian buildings and 1960s blocks and they still aren't fit for purpose, what do you do? Schools and colleges are coming up with creative solutions to meeting their need for better facilities. Here are two examples. Lutterworth Grammar School and Community College in Leicestershire recently developed a new library and e-learning building. Initially, Leicestershire County Council secured a £275,000 grant from the DfES under the Teaching Environments for the Future. The grant conditions stipulated a totally flexible space of at least 200 square metres, located in close proximity to the resources/library area. To meet the grant conditions, both internal conversion and a new build were considered and discounted due to problems with the loss of teaching space, restrictions on circulation and on natural light and high costs of relocating services. There would also be significant disruption to teaching and learning nearby while work progressed. We realised a more radical solution was needed. We had to look at moving the library. The school undertook a review of pressures and opportunities around the site. Part of an old swimming pool site would become available following the opening of a new leisure centre. Next to that was the existing pre-school unit which was housed in a mobile classroom that was too small to meet the demand for places and needed replacing. Although the swimming pool site offered much needed space, this would have placed the new building on the boundary, with the pre-school between it and the rest of the site. Again we had to look at the wider picture. Part of the school land bordered a primary school which helpfully agreed to let us relocate the pre-school to an area straddling the boundary between the schools. This would allow us to build on the old pre-school land with minimum disruption to students and no significant restrictions on the building configuration. We would also be able to convert the old library into flexible accommodation for performing arts, with the inadequate rooms they left being used for training and meeting rooms for both staff and community use. So, after much thinking and rethinking we had our ideal project - with an outline cost of over £1million and a grant providing £275,000. We had accumulated reserves in our revenue budget of around £150,000 and managed to secure £12,000 through the Sure Start programme to extend the childcare provision. Our pre-school also generates income, as does letting our premises. Faced with the gap in funding, we looked seriously at the local financial management scheme which requires local authorities to offer loans to schools. Leicestershire's scheme allows schools to borrow up to 5 per cent of the annual revenue budget for up to five years. With the loan, we could just afford the project but we would be committing significant amounts from future years' budgets, with the uncertainties of those budgets. Balanced against this was our strong belief that we should not be putting money away in a fund, as this took resources away from one cohort of students to benefit later groups. We decided on the loan, knowing that it would be repaid from budgets supporting the students who would benefit from the investment. The project was managed by the facilities manager with support from the principal and myself, as bursar. This meant a significant time commitment for her, with the need to restructure her team to enable the day-to-day functions to continue. Having someone with the right skills on site was of tremendous benefit in co-ordinating the work and liaising with neighbours, planning departments, contractors and staff. We were able to achieve better value by managing some work and contracts in house. The new building, completed in 2005, offers a library on the ground floor with flexible learning space on the first floor. Reflecting on the project, the need to think beyond the original brief and look at the whole site issues was crucial. The decision to take out a loan was not made lightly and indeed caused significant worries when we had a reduction in post-16 numbers the following year. Thankfully numbers have risen again and this looks like a one-off. We are still, however, at the mercy of changes in funding levels and increased costs but we offset this against the benefits that the new facility provides to students, staff and community users. Graeme Hornsby is bursar at Lutterworth Grammar School and Community College, a 14-19 comprehensive school with 2000 students on roll. Like most places, Runshaw College's ICT facilities had grown up organically around the campus as the need arose. However, by 2004, we became aware that the requirements of students and staff had outgrown the existing IT suites scattered around the various buildings. There had been a growing demand for flexible, open-access IT facilities for students, and teaching staff wanted centrally located, bookable IT rooms. Looking to the future, we anticipated that the advent of online exams and testing would also require more variable facilities. The case was made for a purpose-built IT centre. The ideal location was a site in the centre of the college, at the time occupied by two outdated, portable buildings. However, the site presented several challenges. It is land-locked by other buildings and therefore relatively inaccessible for a conventional construction. More particularly, during term time, there is continually high student traffic around the site which would have posed health and safety risks. The idea of a conventional building was soon discarded in favour of the possibility of a prefabricated building. This option would allow the building to be erected over the summer break, whereas it would have taken several months to complete a similar size conventionally constructed building. After considering several prefabricated options, we decided to purchase a Northlight Studio, an off-the-shelf solution, from Conport Structures. It provided the size flexibility that we needed and it was ideal for use as an IT centre because of the high level of natural lighting and security. The windows start at 3.5 metres above ground level, yet the total window space is 40 per cent of the floor area. To complete the project to a very tight programme, it was managed by myself and supported by an architect. Detailed co-ordination and liaison was required between the main contractor and supporting contractors for the construction of the concrete base and the companies doing the internal fit-out. Building work started at the beginning of the summer holiday and by the autumn term we had a 420 square metre, prefabricated building in the centre of campus. It comprises four IT rooms, each containing 30 networked, internet accessible PCs, plus a staff haven with 12 PCs and an IT technicians' room. The internal walls between the four IT rooms have folding partitions. This allows the space to be opened up progressively to allow a maximum of 120 users to be supervised by one member of staff. The capital budget of £500,000 was funded totally from college reserves. Initially we applied for capital grant funding from the Learning and Skills Council, but they declined the grant on the basis that it was not a conventional construction. Ongoing costs are funded from existing budgets. As another money-saving bonus, our data seems to indicate that the building is more energy efficient than a conventional build. Martin Smith is Director of Finance and Corporate Services. 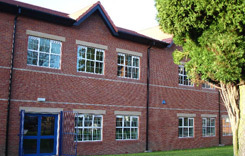 Runshaw College in Lancashire is an FE college with a large sixth form centre.